The worldwide Customer Relationship Management software market reached $18 billion in 2012 according to IDC and continues to achieve low double digit growth. When dissecting the CRM suite into its three segment components of marketing management, sales force automation and customer support, disparate growth becomes visible. For the last four years marketing management software continues to show the highest compound annual growth rate (CAGR) of approximately 15 percent per year. Sales force automation (SFA) sustains annual growth of approximately 10 to 12 percent and customer support software trails at approximately 4 percent. From a vendor penetration perspective, Eloqua and Marketo show the highest growth in the marketing software segment, Oracle's Siebel continues to hold the largest on-premise SFA share (although that share is declining to SAP), Oracle and SAP continue to battle for the lead position in the customer support segment, Salesforce.com leads in SaaS CRM market share and SugarCRM leads in SaaS CRM market share growth. With Oracle's acquisition of Siebel Systems in January 2006, the enterprise tier of CRM software systems has been relegated to a two horse race between SAP and Oracle. According to research from Gartner Dataquest, SAP is the global market share leader for CRM, ERP (Enterprise Resource Planning) and SCM (Supply Chain Management) business software systems. Gartner has traditionally measured measured market share in terms of new software license revenue, however, has more recently adjusted its measurement approach to include total software revenue as generated from new licenses, updates, subscriptions and hosting, technical support and maintenance, however, excluding professional services and hardware revenue. However, according to competing analyst firm IDC, Oracle was the market share leader in transactional CRM applications with a market share of 15.6% while SAP earned the second place position with 10.8%. Oracle's acquisition of Siebel Systems is largely complete with the exception of the much hyped project Fusion. Oracle's biggest CRM gains in the coming year will likely be in the public sector (mainly in the Americas), financial services and consumer packaged goods (CPG) business sectors. Not content to let Oracle claim any leadership position, SAP claims the sole CRM market share leader position and its SAP CRM solution continues to exceed forecasts. SAP has also entered the software as a service market with a new hosted product called Business ByDesign. While it's on-demand CRM and ERP system does not yet favorably compete with the SaaS pure plays, it clearly signals an intent by SAP to do more than stand on the sidelines when it comes to hosted business systems. SAP is expected to show the greatest CRM growth in the government (except for the Americas), utilities, telecommunications, CPG, wholesale distribution and discrete manufacturing sectors. While impressive gains have been made and growth continues nearly unabated, the SaaS CRM software systems have yet to either focus on traditional market segments or industry solutions. Salesforce.com retains the highest SaaS market share and pursues an all things to all people approach. While the company has some of the largest hosted accounts, the majority of its client companies operate with less than 20 users. NetSuite offers a bit more focus as a small business CRM and ERP (Enterprise Resource Planning) solution and is flush with cash from a successful IPO in December 2007. 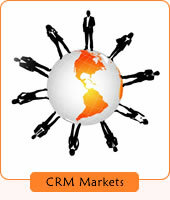 Aplicor is another CRM and ERP hosted supplier and shows focus in the middle market and enterprise market. Along with Salesforce.com, Aplicor boasts several accounts exceeding 1000+ users. Somewhat surprisingly, the SaaS market is slow to mature into the traditional SMB, middle market and enterprise spheres. While SaaS industry solutions are slowly being introduced, they continue to lack the depth and maturity of the prior era client/server and on-premise vertical solutions. Technology is becoming the common denominator among Customer Relationship Management software systems globally. Nearly all CRM systems are building upon the increased adoption of Web services and service oriented architectures (SOAs) in order to reduce technical complexities and deliver measurable benefits. These two increasingly popular technologies are driving interactivity and cooperation among nearly every type of enterprise business software application. SOA reduces the uniqueness and variability of individual software applications by changing the development focus from individual feature sets being programmatically coded to the composition of business process services being completed in a workflow fashion. SOA software solutions also create integration hooks and utilities so that they can facilitate data sharing and services fulfillment in a more logical and structured fashion and without the traditional system integration complexity and costs. Using SOA technology, enterprise software applications are delivering composite applications, mashups and XML web services libraries that transcend individual applications in order to support business processes across lines of business, geographic locations and unrelated business entities.